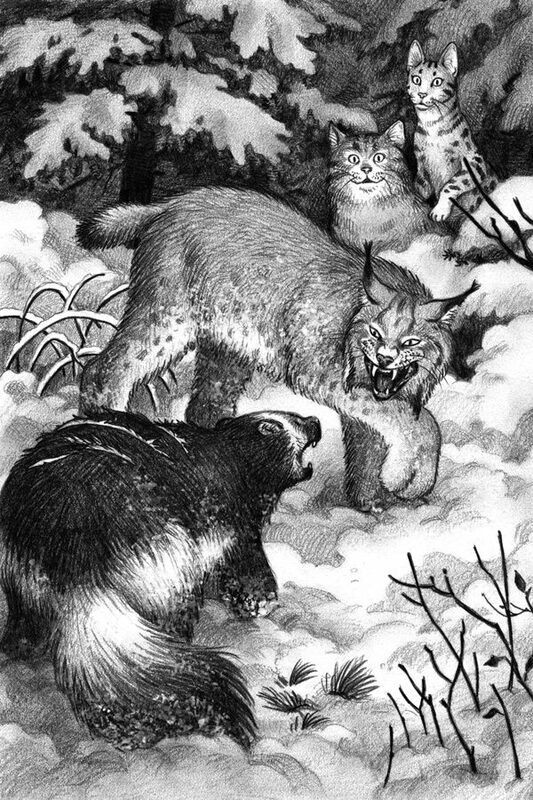 Last summer I worked on illustrations for a middle grade chapter book, Gilly & the Snowcats, by R. S. Bovard. The book was recently released in December through Mill City Press, and is available on Amazon and Barnes & Noble online. 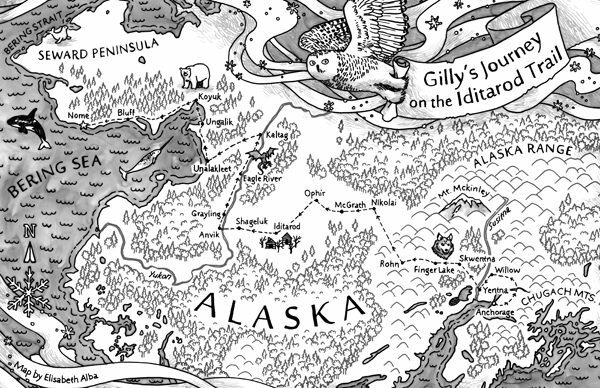 I enjoyed working on this adventurous book with a strong, young female lead, creating the book cover, a map of Alaska, and seventeen interior drawings. The book cover was created with watercolor, colored pencil, and acryla gouache; the map is ink on vellum; and the interior drawings are pencil. From the back cover: “The Iditarod dogsled race is a big deal in Gillian Wells’s hometown of Anchorage, Alaska. 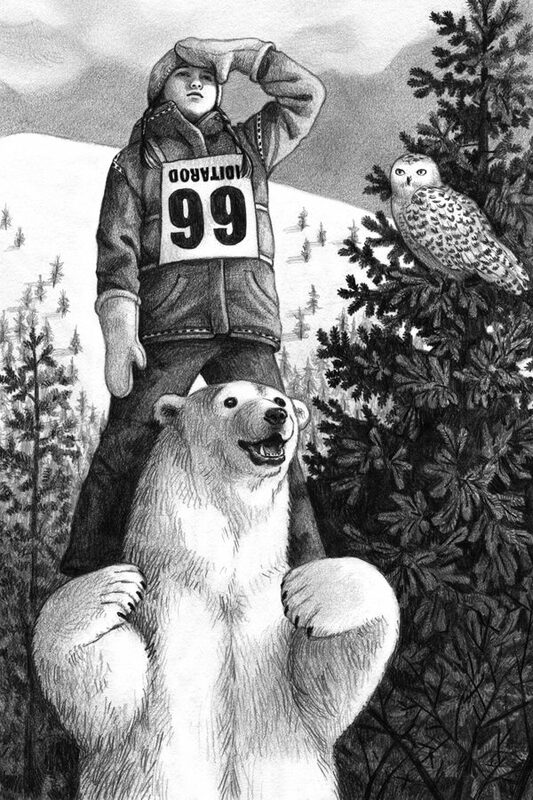 Twelve-year-old Gilly knows the names of all the famous mushers and admires the women most of all. Gilly wants to join this brave group of women and complete the dogsled race herself. The only problem? She likes cats. 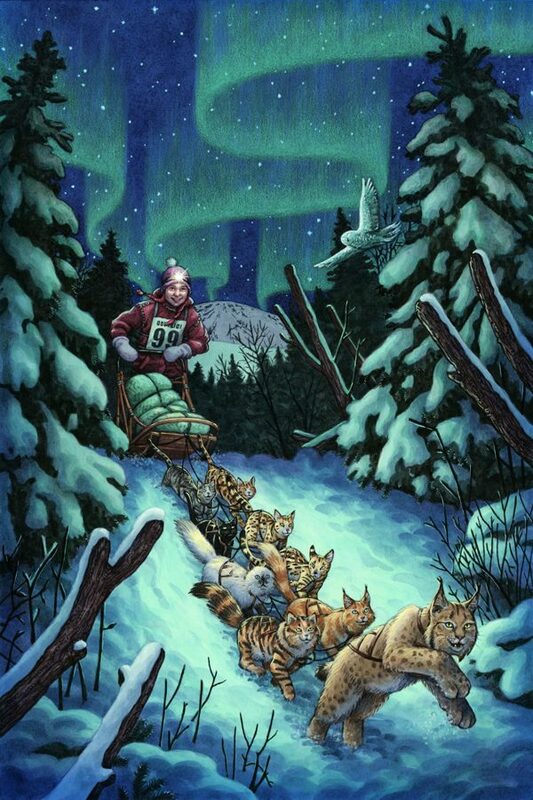 “Gilly’s dad, an experienced Iditarod racer, is doubtful of Gilly’s goal, but she wastes no time proving him wrong. After all, she already has two cats, Lola and Shadow, and after a few fateful encounters, is able to recruit seven more intrepid felines. Gilly’s good fortune continues: her mom and dad will be away on vacation the very same time as the race! Elisabeth is an illustrator of middle grade, YA, fantasy, fairy tale, and new age subjects, as well as cartography. Elisabeth was born in Pittsburgh, Pennsylvania, but most of … Show more. Send a message directly to Elisabeth Alba. Elisabeth is an illustrator of middle grade, YA, fantasy, fairy tale, and new age subjects, as well as cartography. Elisabeth was born in Pittsburgh, Pennsylvania, but most of her 'growing up' took place in Orlando, Florida, where she wallowed in all things Disney. Traveling much with her family led to an obsession with history and an interest in other cultures throughout the ages. She has always loved children's literature and film, especially fantasy and historical fiction. Elisabeth earned a dual degree BA from the University of Florida in English and visual art studies. She earned her master's degree in illustration at the School of Visual Arts in New York City. She now lives and works in Western Massachusetts, along with her husband, illustrator Scott Murphy. She is a member of SCBWI and the Western Massachusetts Illustrators' Guild. Her work has been recognized in 3x3 Vol.6, Illustration West 51, Infected by Art 3, 4 and 5, Spectrum 23, and Imagine FX magazine. Her work has been exhibited in such places as the Canton Museum of Art, the Springfield D'Amour Museum of Fine Arts, the Gen Con Art Show, and IlluxCon.